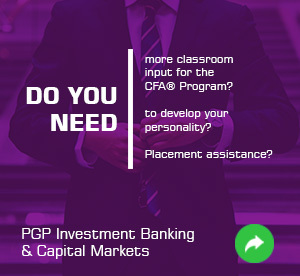 The CFA® Program is a globally-recognised professional certification program that provides a strong foundation for students and professionals for careers in Investment Banking, Equity Research, Capital Market, Portfolio Management, Corporate Finance etc. CFA Institute was established in 1947. Over these 70+ years, The CFA® Program has emerged as the benchmark qualification for the investment industry. It has grown to over 150,000 charter holders around the world in more than 165 countries. The CFA® charterholders today work as Portfolio Managers, Equity Research Analysts, Fund Managers, Wealth Managers, CFOs and Risk Consultants. Completing The CFA® Program confirms mastery over the rigorous curriculum as can be evinced by you. Clearing all the three levels of the exam is the main requirement for earning the CFA® charter. It covers content required for investment industry segments like Equity, Fixed Income, Private Equity, Derivatives and Real Estate. The CFA® charter is one of the most recognised and respected investment credentials in the world with more than 60 years of legacy. The CFA® Program has an in-depth focus on financial modelling, portfolio management, and other investment related areas. Top investment firms, asset management, hedge funds value this knowledge base and give more preference to charter holders than other candidates from related fields. The CFA® Program is not just limited to investment banking and equity research, but plenty of other profiles as well. Today, be it Fintech, Foreign Exchange, Alternative Investments or other offbeat profiles, CFA® chartedholder are the most preferred options for employers. A CFA® charterholder upholds the highest professional standards and abides by a strict code of ethics. Extensive ongoing analysis ensures that charterholders uphold the best global practices in their work. The CFA® charter is conferred after the completion of 4 years of relevant professional engagement, which means that the institute believes in practical skills. The curriculum is also designed in a way which helps you to tackle the real-world scenarios in an effective way. The Qualification is one of the best options to an individual who does not have the time or the resources to go through a full-time MBA Finance program for entering the investment finance industry. CFA Societies® present worldwide give you access to more resources to boost your career prospects. Being part of these societies will not only increase your networking opportunity but also your chance of landing a dream position. 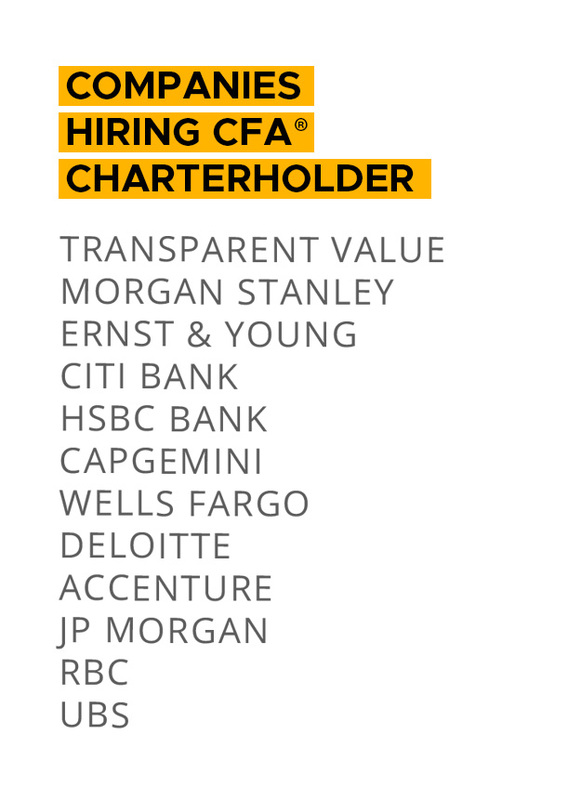 CFA Societies® also post job openings specifically for charter holders. Who should pursue The CFA® Program? Fresh Graduate: Any fresh graduate willing to make a career into the investment finance industry, will be equipped with the world class knowledge. Investment Industry Professional: A candidate who is already working in the investment finance industry but wants to gain better understanding and recognition. Self Understanding: If you are or willing to understand more about portfolio management or want to equip yourself to manager your wealth then CFA® designation becomes the right choice. As International financial firms are focusing on the reduction of the cost of labour, they are outsourcing the majority of the work in India due to cost advantage. All the international KPO ’s, investment banking and financial servicing firms are looking for the highest credential in investment finance industry like CFA® charter, which is a great opportunity for the CFA® charterholders in India. Location: In India, CFA Institute conducts exam for June attempt in 10 cities: Ahmedabad, Bangalore, Bhopal, Chennai, Hyderabad, Kolkata, Lucknow, Mumbai, New Delhi, Pune. Negative marking: There is no negative marking in The CFA® Program exam. Reattempt: There is no limit on the number of attempts for re-taking the exam but exam fees is needs to be paid separately for each re-attempt. Grading Procedure: The grading of CFA® Program results happen on the basis of MPS ( Minimum Passing Score), after every exam a MPS is calculated based on the performance of a average candidate. Based on the MPS the student gets the result of the same. What are the exam fees for all the three level Exams? How is the CFA® Program different from CA? The focus area of CA is Auditing, Accountancy, and Taxation whereas the focus area of CFA® Program is Investment Banking, Equity Research, Investment Advisory Services, Portfolio Management, Wealth Management, etc. CA is a statutory qualification in India whereas CFA® Program is an international qualification recognized by any Investment company across the world. You can start preparing for the CA right after the 12th standard whereas you can start pursuing the CFA® Program only after graduation. How is the CFA® Program different from CIMA? The CFA® Program is investment oriented. Pursuing CFA® Program means getting into Investment Banking, Mutual Funds, Derivatives, Portfolio Management, Equity / Debt Research, Financial Services, Fund Management for large institutional investors, Banking Industry etc. It has more emphasis on the analysis and research side as compared to accounting. In contrast, CIMA is an ‘management accounting qualification’ for those working outside public accounting (i.e. audit) It is more about accounting and related issues within finance departments and companies. How is the CFP different from CFA® Program? Both the qualifications are recognized across the world. The focus of the CFP curriculum is only to make financial plans for an individual whereas the focus of the CFA® Program curriculum is to not only make financial plans but also capable to do research and work in other domains of investments finance industry. CFA® charter holders work in financial areas that deal with institutional investments where as CFP Certificants are involved in advising individual investors, typically with smaller investment portfolios. Recognition: As an analyst with a CFA® designation, you would intensively analyze individual companies and industries. Area: The CFA® charter holders is oriented towards financial research and analysis whereas the CFP looks at investment planning for individuals. Duration: CFA® Programs takes at least 2 years to complete, while the CFP can be completed within a year. Eligibility: You can start pursuing the CFP after the 12th while you can sit for the level 1 of The CFA® Program only after graduation or during the final year of your graduation. Expenditure: Total expenditure of the CFP along with tuition fee is INR 50,000 to INR 60000, The CFA® Program expenditure is between INR2 lakh to INR 2.2lakh. Commitment: Compared to CFP, The CFA® Program exam is tough and requires more time commitment. Salary: Average salary just after completing the CFP is in the range of INR 2 lakh to INR 4 lakh on the other hand after The CFA ® Program it is in the range of INR 4 lakh to INR 12 lakh. Exams: To get the CFA® designation, you must take three exams, each one in a separate year. The exams cover Finance, Accounting, Economics, Investments, and Ethics while in CFP you have to write five exams viz Investment, Retirement, Tax, Insurance and Advance Financial Planning. Work Experience: In both CFP & The CFA® Program, you need to meet certain education and work experience requirements. You need to have 4 years of relevant work experience for The CFA® charter and 3 years of relevant work experience for the CFP Certification. I am an Engineer, how will CFA® Program help me? 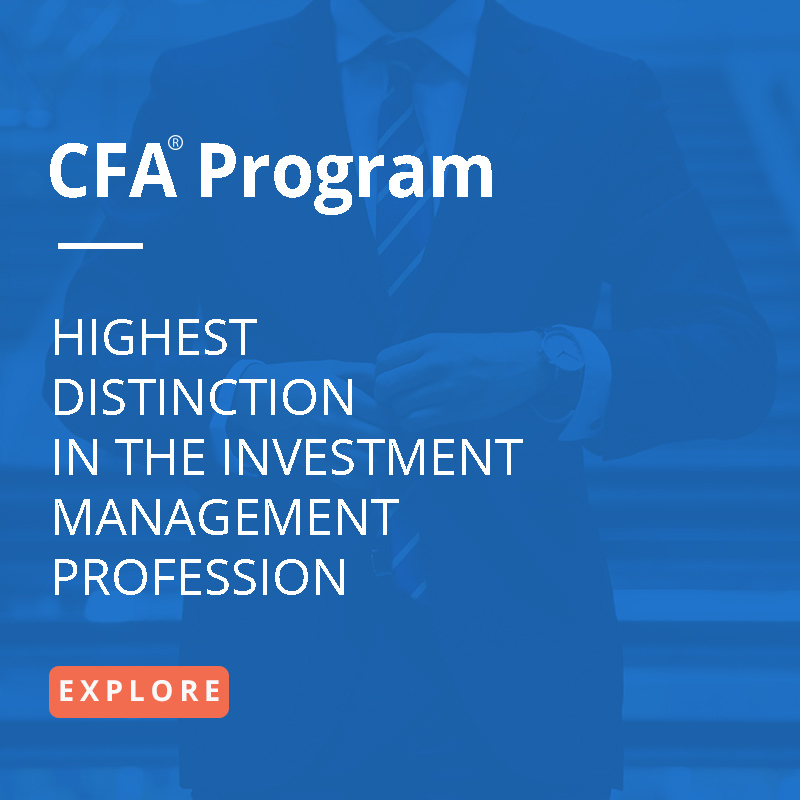 Without an MBA degree from a reputed B School, it is tough for engineers to get into finance, but with the CFA® Program, it is possible because the CFA® Program is focused on Investments. If you’re an engineer who wants to make a career shift to a financial field then the top priority should be a CFA® Program. The engineering background gives him/her quantitative problem-solving skills. Along with this if she/he has a CFA® charter she/he is a perfect match for the investment industry. If you’re good at numbers and have an interest in finance, you should do the CFA® Program Financial engineering/quantitative finance is a field where they like to hire engineers. Should I do Fnancial Modeling along with The CFA® Program? The CFA®charter is a qualification whereas Financial modeling is a skill used in the investment finance industry. The CFA® charter is an indispensable qualification for professionals who are looking for a long-term career in investment analysis. CFA® Program will prepare you conceptually for subjects such as Financial Reporting Analysis, Fixed Income, Economics etc. In Financial Modeling you will learn how to use the concepts of Financial Statement Analysis, Economics in practice. In Financial Modeling you do all the calculations on excel whereas in the CFA® Program you will solve all the calculations on the Financial Calculator. It will teach you to perform company valuations and make you job ready from day 1. Many students do Financial Modeling first before pursuing CFA® Program, because it will help them prepare the foundation for CFA® Program at the same time it can help them get a job in Equity Research, Financial KPOs, etc. Cooperative staff and well qualified faculty. Best institute for CFA® Program training in navi Mumbai.